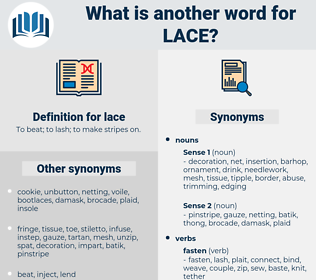 What is another word for lace? 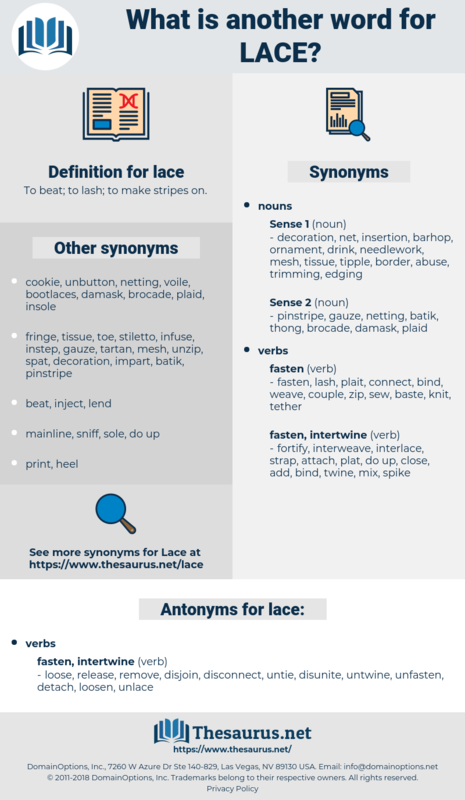 loose, release, remove, disjoin, disconnect, untie, disunite, untwine, unfasten, detach, loosen, unlace. They were as white as the lace falling over her superb silk dress. I've been trying to match this piece of lace for years. losses, laugh, lose, lac wax, loge, lallygag, lychee, lachaise, lock away, lux, locke, leech, lack, lasix, log z's, lassa, laius, lachesis, low-key, lessee, Louis XI, Leo Esaki, loess, lycee, louse, lake keuka, loco, logo, luggage, luge, Louis Ii, lexis, Lech, lxi, lxxiii, laze, liliaceous, lox, lochia, leacock, lazio, laws, loligo, lewis, loki, lewisia, lollygag, lake, Louis Iii, legacy, lackey, lxxii, lazy, liliales, lisu, leuciscus, loose, luke, leash, laugh away, loos, less, lichee, lacy, luxe, lie awake, lockage, leg, Louis X, look away, lagos, lxxxi, llullaillaco, lawless, liaise, liza, lysis, lease, lxxxii, laic, league, logy, lxxxiii, leakey, lyssa, luscious, lechwe, Louis I, lac, lxxx, Louis Xiii, loloish, lx, lugosi, locus, lag, leggy, like, lash, lossy, luik, laicise, lxiii, leak, lug, luck, leach, Lusaka, lassie, lycosa, lush, Louis Agassiz, logic, leek, lucky, louis, laos, lilylike, lockjaw, loxia, lough, luce, lucas, loggia, lees, loasa, leo xiii, lycia, leakage, lousy, Louis Ix, look, Lego, lichi, lhasa, lao-zi, Lake Cayuga, leo ix, lek, lass, leechee, laicize, lxx, log, lygus, lxii, likewise, Liliaceae, leaky, loss, lxxi, liege, lakh, Louis Xii, Lugh, lock, loach, lilac, lucy, Leo X, louche, lasso, logos, loch, leigh, lax, loquacious, lick, lascaux, legs, loasaceae. macrame, pillow lace, point lace, Brussels Lace, bootlace, shoelace, filet, shoestring, shoe lace, bobbin lace, needlepoint, shoe string. cord, material, fabric, textile, cloth.